A South African shrub used as a hedge or free standing shrub because of its interestingly formed branches and shiny deep-green leaves, offset by white and pink, sweet-scented flowers. The plant bears a 2" egg-shaped red fruit that can be eaten out-of-hand but does make good cranberry-like preserves. 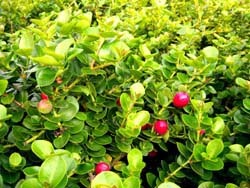 It is a salt tolerant plant, and grows well along the coast. Cold-tolerant to about -4ºC. Requires light.